Sorry... the 2017 Volkswagen Beetle is no longer being sold as new. Instead, take the first step to a great deal on 2019 Volkswagen Beetle with a free price quote! 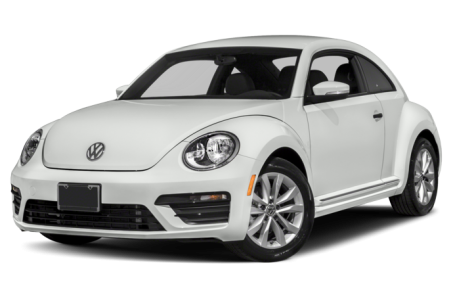 The 2017 Volkswagen Beetle is the modern interpretation of the classic bug. It comes as a 2-door hatchback or a 2-door convertible; both can seat 4 passengers. It competes with the Ford Focus, MINI Cooper, and Hyundai Veloster. This year, the trim levels have been revised. Volkswagen is introducing new Classic and Pink Beetle trim levels to the lineup. Seven trim levels are available for the hatchback: the S, Classic, Pink Beetle, SE, Dune, SEL, and R-Line SEL. The convertible has 5 trim options: the S, Pink Beetle, SE, Dune, and SEL. The second-generation Beetle has a sporty appearance that features a low stance, wide-mouth front air vents, bulging front and rear fenders, and clean body lines. The R-Line front bumper now comes standard on most Beetles except for the Classic Beetle and Dune Beetle, both of which have their own unique front-end styling. Other standard features include a rear spoiler, automatic headlights, power and heated side mirrors, and 16-inch wheels. Xenon headlights, LED daytime running lights, fog lights, LED taillights, a panoramic moonroof, a dual-pipe exhaust system, and larger 17-, 18-, or 19-inch wheels are also available. The Classic Beetle comes with retro-inspired “Circle” wheels and last year’s standard front-end. The Pink Beetle comes with bright pink exterior paint and unique 17-inch Linas wheels. The Beetle is powered by a standard 170-hp, turbocharged 1.8-liter 4-cylinder engine mated to a 6-speed automatic transmission and front-wheel drive. Powering the R-Line SEL trim is a 210-hp, turbocharged 2.0-liter 4-cylinder with the same transmission and layout. A 5-speed manual is available at no extra cost. A 6-speed manual is available for the R-Line trims. Fuel economy for the 1.8T trims is an EPA-estimated 25/34 mpg city/highway. It drops to a 23/31 mpg rating for the R-Line trims. Inside, the Beetle has a sporty, black interior with standard cloth seats. The center console features the MIB II multimedia system, which includes a standard 5-inch Apple CarPlay/Android Auto compatibility, Bluetooth connectivity for phone and audio, and a USB port. It can be upgraded with a 6.3-inch touchscreen, an integrated navigation system, App-Connect smartphone integration, and a Fender premium audio system. Standard features include remote keyless entry, air conditioning, power windows/locks, a tilt/telescoping steering wheel, an automatic dimming rearview mirror, heated front seats, and cruise control. A security system, push-button start, leather seats, and dual-zone climate control are available as well. The Pink Beetle comes with its own unique black and pink trim interior treatment as well as pink “Club” cloth seats. The Beetle hatchback earned a full 5-Star overall crash safety test rating from the NHTSA. Standard features include front airbags, antilock brakes, and an electronic stability system. A backup camera, a blindspot monitoring system, a limited slip differential, and parking assist are available. 23 of 23 (100%) consumers said they would recommend this vehicle to a friend.